Warnings about the loss of nature and the environment and the danger that presents to our children’s futures? These are often met with disbelief and brushed aside. Nevertheless, it’s very real. The diversity in plants, animals and ecosystems represents the greatest asset on our planet. It is the basis of all life. And this diversity is in dire straights, in frightening dire straights. The rate at which species are currently vanishing is estimated at 100 to 1000 times higher than ever before in recorded history. On average, the population of wild animals worldwide has halved. Fish, reptiles and amphibians that live in fresh water are under the greatest threat. The loss of biodiversity is gravest in tropical areas. There are many factors that affect the loss of species: climate change, land appropriation, the utilisation of agricultural pesticides and artificial fertilisers and deforestation. Compared to 300 years ago, the Netherlands has managed to preserve only 15% of its biodiversity. 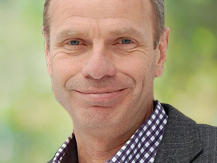 Professor Jan Willem Erisman (1961) is CEO at the Louis Bolk Instituut, an institute for international advice and research on sustainable agriculture, nutrition and health care. Erisman is also researcher at the International Geosphere Biosphere Program (IGBP). His research focuses on optimizing food production and energy use while minimizing the environmental impacts from increased nitrogen cycling. Earlier his research focused on climate change and he advised policy makers on this subject. Erisman is also extraordinary professor at the VU University Amsterdam on Integrated nitrogen studies. Research focuses on the interaction between nitrogen and climate, the use of satellite data to improve nitrogen exposure and deposition and on the improvement of nutrient efficiencies in agriculture and energy use to improve the environmental quality (estuaries, seas and oceans, air, human health, biodiversity and ecosystem services).